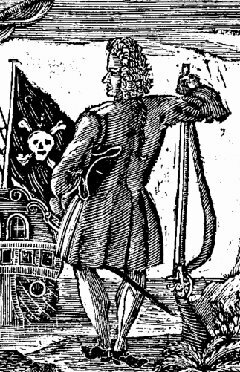 On this date in 1718, the Barbados buccaneer Stede Bonnet was hanged for piracy in Charleston, S.C.
Bonnet had few of the typical swashbuckler’s resume-builders during this Golden Age of Piracy: he was neither a mariner by trade nor a desperate outlaw by circumstance, but a wealthy English landowner in Bermuda. Bonnet’s version of a cherry-red convertible was a six-gun sloop named Revenge,* which he tricked out from his ample inherited fortune and took cruising for action on the North American coast. Or, just get this Victorian satire free from Google books. 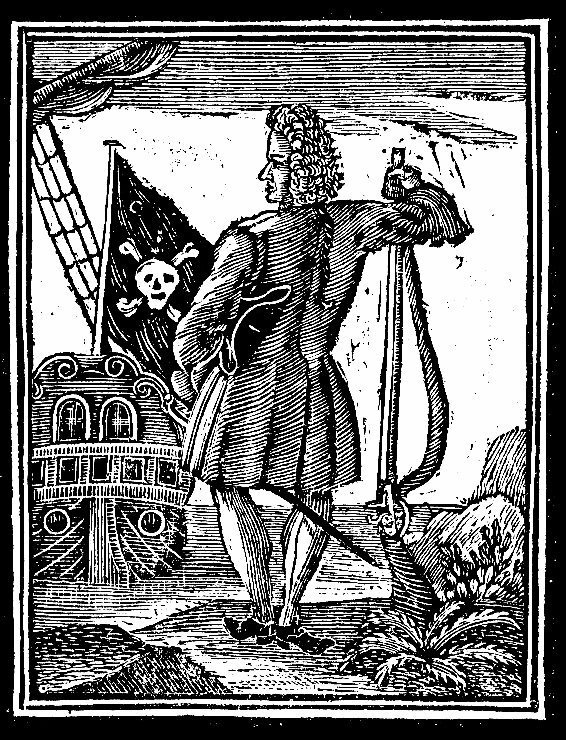 He raided from New England to the Carolinas, fell in with Blackbeard (which more credible cutthroat charismatic promptly appropriated Bonnet’s hireling** crew), lost his ship, got it back, turned himself in, got a pardon … the rich guy packed plenty of adventure into little more than a year of raiding, but he never seems to have advanced his freebooting skills past the “gentleman hobbyist” level. South Carolina ships captured Bonnet near Cape Fear, which is actually North Carolina, but never mind: South Carolinians well remembered this character from his involvement with Blackbeard’s recent blockade of Charleston. Bonnet got gentleman’s quarters upon detention, and his elite education enabled him to favor the colony’s governor with a simpering plea for clemency. All of which pathos was unwisely belied by an escape attempt which made pardon completely untenable. 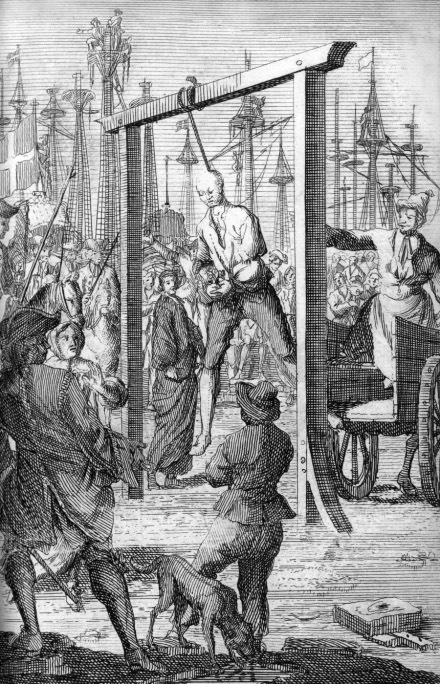 Most of Bonnet’s captured crew was hanged en masse on Nov. 8; Bonnet managed to drag on several stays of execution before he followed them from his comfortable digs to the common gallows. A stone monument marks the spot. * There were many pirate ships Revenge, including that of famous women pirates Anne Bonny and Mary Read and that of the Dread Pirate Roberts. There’s also a band “The Pirateship Revenge”. ** Bonnet paid his crew out of his own pocket, a practice at odds with the more egalitarian pirate norm of crews taking like shares and choosing (or demoting) their own captains.